Jeremiah Hackett is a young man searching for a future. On his quest, he teams up with huckster George Finimin, a tonic salesman. When Finimin is murdered, Jeremiah dedicates himself to finding the killer. But things do not prove straightforward for Jeremiah, and he needs to mature and learn some harsh lessons before he can finally achieve his aim. I have a few short stories by this author but this is the first full-length book I have read by him. This is not his first for the Black Horse Western line, and titles for this publisher have appeared under two variations of his name; J.L. Guin and Jerry Guin. The first chapter tells of Finimin’s killing and the next couple go back in time to explain why Hackett left home and how he teamed up with Finimin. 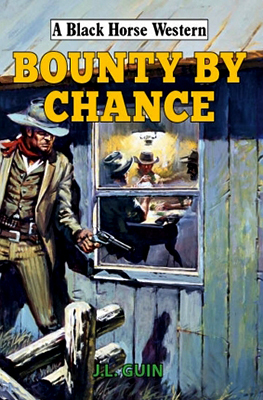 The rest of the book follows Hackett’s attempts to track down Emil Croft (the man who killed Finimin) and it’s during this part of the story that the books’ title becomes clear as Hackett takes out two men by chance and learns of a bounty on their heads. Can Hackett take up bounty hunting whilst still selling tonic to finance his hunt for Croft? Hackett’s quest for vengeance takes a number of years and it’s during this time that his life changes somewhat and he takes a youngster under his wing and the parallels to his life with Finimin become apparent. It’s then you begin to wonder if the story will end in a similar fashion too, especially as since Crowood took over publishing the Black Horse Western line from Hale they seem to be more open to stories that are harder hitting, that are darker in tone and don’t always have a happy ending. Is this one of them? I’ll leave you to find that out for yourself. Guin writes in a very easy to read manner, his words urging you not to put the book down. Character studies are excellent and the action scenes are vivid, killings quite graphically described. All the story threads are tied-up neatly after a final bloody gunfight bringing the book to a satisfying conclusion.